The majority of tourists that decide to visit Istanbul arrive by airplane. However, it is also possible to reach İstanbul by car, train (passing through Greece) or by ferry. Lately, more and more people are choosing to visit the Mediterranean with a cruise company, thanks to their very affordable prices. Costa Cruises, MSC Cruises, Norwegian Cruise Line, Celebrity Cruises, Princess Cruises, Aida Cruises, Carnival Vista and Holland America Line, in recent times, have developed and given increasing importance to the routes of the Eastern Mediterranean. Depending on the offer available, but, generally, spending between 600 and 1000 euros per person, one can enjoy the experience of a 7 day cruise on a luxurious and beautiful ship (for example: MSC Poesia, Island Princess, Celebrity Reflection, Norwegian Spirit). These ships depart normally from Venice or from Rome and touch the coasts of southern Italy, Greece (Katakolon-Olympia, Athens or some beuatiful islands in the Aegean Sea), Izmir (Smyrna), Kusadasi, Dubrovnik in Croatia, Malta or Tunis, some of them will continue until the Black Sea touching Bulgarian and Romanian coasts. Obviously, 7 days of cruise with all the meals included and various entertainments available on the ship represent an attractive and convenient option. Nonetheless, when the cruise ship stops in a city as enthralling to see as it is İstanbul, few are not driven by the desire to visit it! Unfortunately, the time on hand to visit the city is very little, because usually the cruises dock at around 7.30 in the morning and depart the same day at around 17 in the afternoon. The cruise companies use this short time available as an excuse to sell off shore excursions, which are very expensive (at least 120 euros for 7 hours of tour) and, eventually, quite disappointing. In fact, first of all, an identification number is assigned to the excursionists, who are then taken in crammed coaches to few places of interest; for lunch time, they are led to a restaurant passed off as ‘typical’ (but that is not) and, finally, their visit will be ended in a carpet shop in the Gran Bazaar, where a commission on sold items had been already agreed between the shop owner and the tourist guide. In our opinion, these types of tours provide the visitor with a distorted image of the city, which cannot thus be truly appreciated. It is a vision of tourism to which we are strongly against. It would be much better then, for whom is really interested in the city, to visit it autonomously. However, since the time available is indeed little, it is advisable to organise oneself in advance about the sights one may be keen to visit and the way to get there. So not to waste precious time! This blog has been conceived precisely to give accurate information to whom has an interest to participate in the life of İstanbul in an intelligent manner, even if only for one day. It is full of tips that will allow you to organise an autonomous day excursion. On the other hand, if you yet prefer to be guided around the city by a knowledgeable inhabitant of Istanbul, we can study together a personalised visit of the city and accompany you. That will also give you the privilege to skip the long queues that are formed at the entrances of the famous monuments. 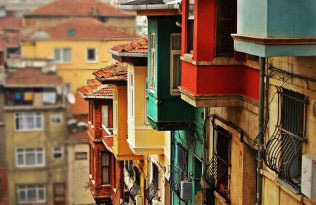 We are a licensed official tourism agency based in Istanbul. We started our career organizing guided tours in Italian with Italian groups and you can read hundreds of feedback on the italian version of our blog and also on Trip Advisor. Now we can do it also in English and we would like to provide the same quality service also to English speaking visitors. This entry was posted in Guida, Istanbul Guide. Bookmark the permalink.